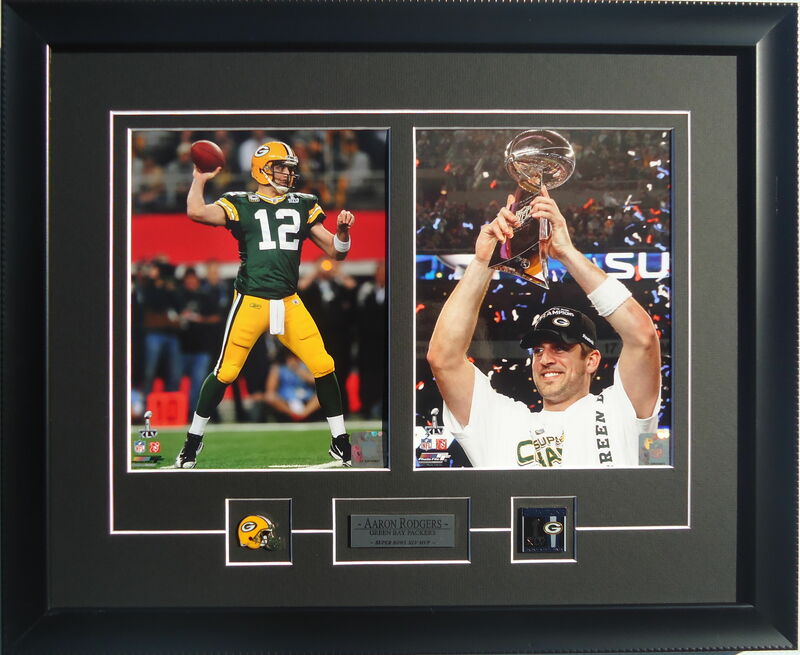 Double 8 X 10 Photo frame of Aaron Rodgers from the Super Bowl Champions XLV – Green Bay Packers. Rodgers completed 24 of 39 pass attempts for 304 yards and 3 touchdowns in the win against the Steelers and was named Super Bowl XLV MVP for his performance. Photo on left is of Rodgers throwing during the Super Bowl game. Photo on right shows Rodgers holding up the Vince Lombardi Trophy after the win. Plate reads: “Aaron Rodgers – Green Bay Packers – Super Bowl XLV MVP”. Authentic Green Bay Packers helmet logo pin attached on left. Authentic Super Bowl XLV Champions logo pin attached on right. Please contact for pricing. Double 8 X 10 Photo frame of Sidney Crosby on the 2010 Team Canada Winter Olympic Gold Medal winning team. Photo on left shows Crosby after scoring Gold Medal winning goal against Ryan Millar of Team USA. Photo on right shows Crosby’s post-medal celebration on the ice with a fan’s golf ball retriever and the Canadian Flag. 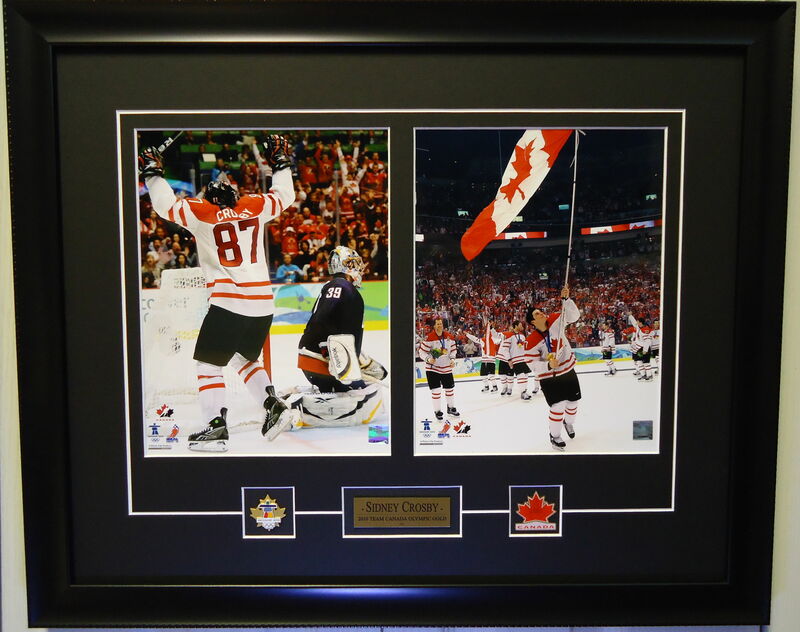 Plate reads: “Sidney Crosby – 2010 Team Canada Olympic Gold”. Authentic 2010 Vancouver Winter Olympic Gold Maple Leaf pin attached on left. Authentic 2010 Vancouver Winter Olympic Team Canada logo pin on right. Please contact for pricing. 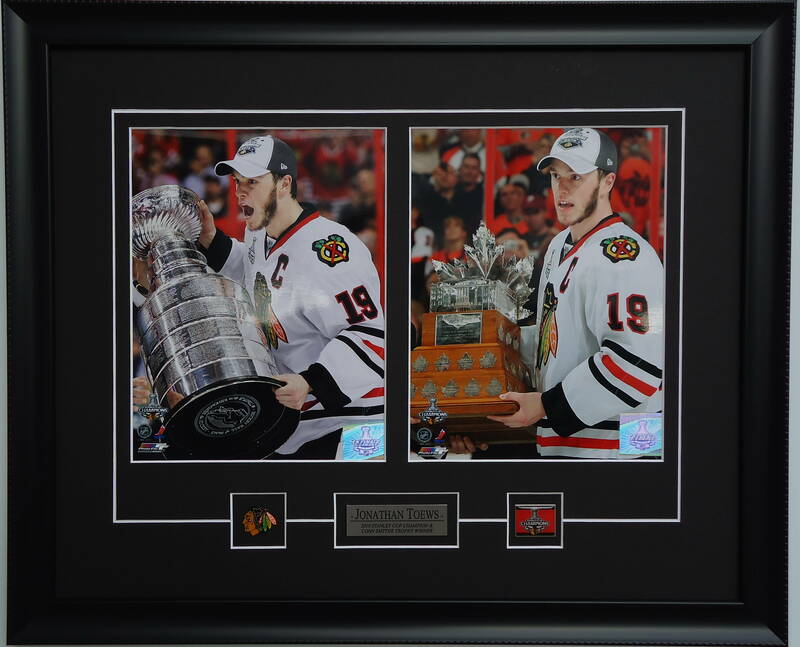 Double 8 X 10 Photo of Jonathan Toews with the 2010 Stanley Cup winning Chicago Blackhawks. Jonathan was also awarded the Conn Smythe Trophy for being the most valuable to his team during the 2010 NHL Stanley Cup Playoffs. Plate reads: “Jonathan Toews – 2010 Stanley Cup Champion & Conn Smythe Trophy Winner”. Authentic Chicago Blackhawks team pin attached on left. Authentic Chicago Blackhawks “Stanley Cup Champions” pin attached on right. Please contact for pricing.